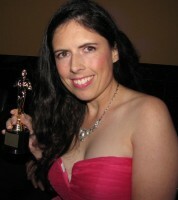 Rachel Galvin’s Indie Streak wins Web Radio Show of the Year! On September 24, Rachel Galvin’s online show Indie Streak was awarded Web Radio Show of the Year by Women in the Arts Miami. On the show, she interviews film industry professionals. Women in the Arts gave awards to many creative individuals, including actors, actresses, directors, screenwriters, models, hairstylists, makeup artists, fashion designers, humanitarians, iconic women and more. Winners were determined by votes on the website given to nominees. The event included a silent auction, the awards ceremony, a fashion show, a short film screening and music by DJ Excel. For more information on the fashion show, visit http://letstalkfashion.blogspot.com. For more on the event, visit www.womenintheartsmiami.com. For more on Rachel Galvin, visit http://en.wikipedia.org/wiki/Rachel_Galvin or http://www.imdb.com/name/nm1320999/. Posted in Hosting. Tagged awards, Diana Laura, FL, Hallandale, Indie Streak, Privet, Rachel Galvin, Web Radio Show of the Year, WITA, Women in the arts.